Driving for Better Business (DfBB) has gone live with a new website that brings a number of new – and free – resources for those responsible for managing work-related road risk. The new website separates visitors into two distinct groups, covering those who are just starting out on their road risk journey and fleets looking for more advanced resources. For the first group, DfBB has identified four easy steps to getting all the road risk basics in order and has created free-to-access resources to help fleets complete all four steps. 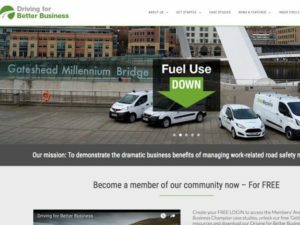 Fleets can also access case studies of accredited DfBB ‘Business Champions’, including the latest case study from Gateshead Council, which has reduced collisions by two-thirds and fuel use by over 50,000 litres per year. Fleets in the second group can join the DfBB ‘Inner Circle’ for access for more advanced resources on subjects like telematics, vehicle safety technology and driver behaviour as well as reading in-depth interviews with DfBB’s Business Champions and technical experts. The plan is to drive Inner Circle membership to a level where members are collectively responsible for over 1 million drivers, sharing best practice and supporting each other. New Inner Circle features also include a report by Kevin Robinson on how to spot the signs of poor mental health in your drivers, and Matthew Avery, research director of Thatcham Research discusses the latest vehicle safety technology and its potential benefits for fleets. The DfBB website is free to join. For more details, click here.